You've booked your flight, but now you need to know how to get from Athens airport to city center. Here's all the information about Athens airport transportation, and how to get to the city center from Athens airport you'll ever need. I've lived in Athens for over 2 years now, and during that time, I must have used Athens International Airport over a hundred times. It dawned on me that whilst I take getting from Athens airport to city center for granted, it might be useful to write a little guide about it. Here's everything you need to know about how to transfer from Athens airport, and how much it costs. (Note for my readers who might be flying into Athens airport with a bicycle – You can just about cycle from Athens airport to the city, but it is a real pain. It's best to take the metro). Each of the 3 basic options of getting from Athens airport to city center has its benefits depending on your situation. Let's take a look at them here. Using the Athens airport taxi service is probably the best option for groups of three or more people, and especially families. The Athens Airport Taxi service has a flat rate of 38 euro during the day (before midnight) to the city center. There is going to be plenty of room for your bags, and the driver can take you directly to your hotel. 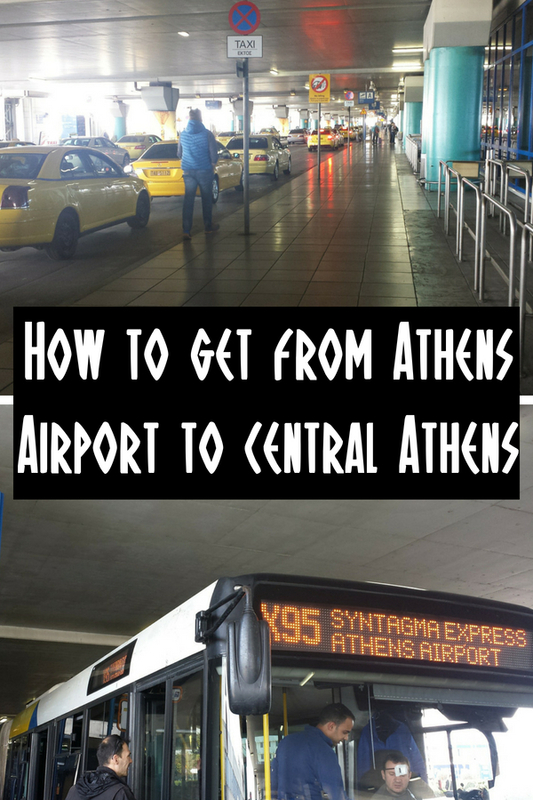 This method provides the least hassle when getting from Athens airport to city center. Catching a taxi from Athens International Airport is very easy. Follow the signs, or simply step outside the arrivals area. There will be a long queue of yellow taxis waiting in line. Walk to the right, and then join the queue for the next available taxi. 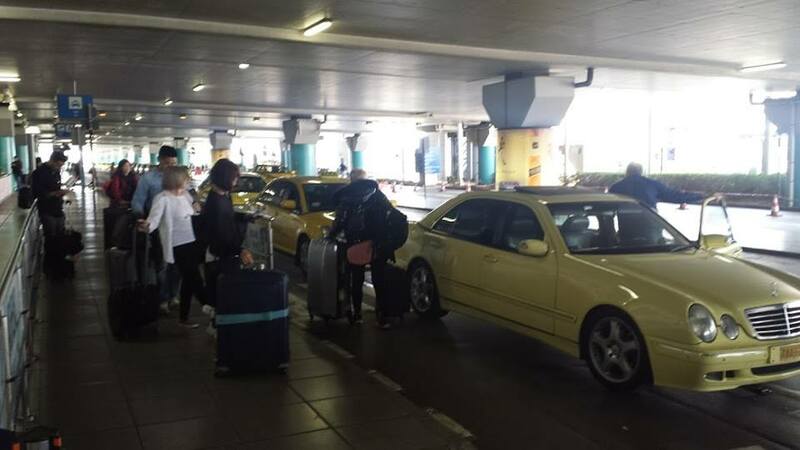 You can also pre-book your taxi with Welcome Pickups and the driver will meet you in the arrivals lounge. This meet and great welcome service doesn't cost you any more money, but it makes life so much easier. You can even pre-order some essential items like a Greek sim card which they will bring for you. During the ride to your hotel in Athens, your driver can also answer any questions you might have. Pros: By far the easiest method of transport from Athens airport to city center. Great for families with many bags. Door to door service to your hotel in Athens. Use Welcome and get those handy essentials like a SIM on arrival to save you time later. Cons: Most expensive method (but cheaper than a metro for four passengers during the day). Passengers should note that if you get in a taxi before midnight but arrive at your hotel AFTER midnight, you will pay the more expensive fare of 54 euros! Dave's Opinion – For groups and families using an Athens airport taxi is the best transport option for getting from Athens airport to the center of the city. Find out more about the service by reading the Welcome Pickups Tripadvisor Reviews. Before researching this article, I had never used the Athens airport metro service. I have to say, for people who are arriving in Athens for the first time, it is NOT user friendly. And this is a shame, because generally speaking, Athens has a clean, modern metro system which makes getting around the city easy. Thankfully, you've got my guide to help you out! If you are determined to use the metro, then follow the signs out of the arrivals area which say ‘train'. You will eventually cross a road, go up some stairs, and then use a bridge over a road system and to the metro station. It takes about 5 or 10 minutes. My advice when you get to the station, is to buy the ticket from the ticket office and then ask which platform you need to be on. The direct line connects with both Syntagma Square in the center of Athens, and with Monastiraki which is the next station down. 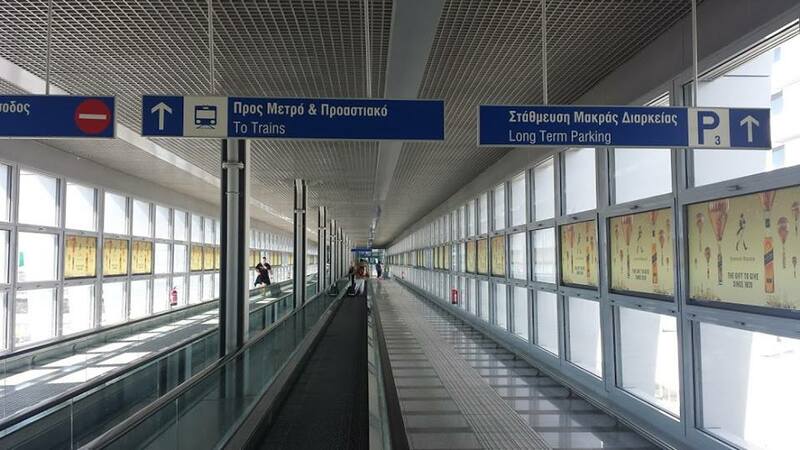 The metro can also be used to go to Piraeus from the airport, but it would involve changing lines. The Athens airport metro map is below. The Athens airport metro runs every 30 minutes, but only between the hours of 06.30 and 23.30. The ticket prices are € 10 for one person, € 18 for two people, and € 24 for three people. A single return ticket valid for 48 hours is € 18. Pros: Fast service. Avoids traffic. If you are staying near a metro station along the way, you can get off early. Cons: Confusing to find your way to the metro station from Athens airport arrivals. Short service hours. It's a long walk to the metro station with bags. Dave's Opinion – Challenging if you have more than 2 pieces of luggage. I wouldn't recommend this for first time visitors to Athens. At 6 euros per person, the Athens airport bus is by far the cheapest transport option. There are 4 separate routes, with the x95 Athens Airport Bus to Syntagma Square being the most popular. If you are staying at a hotel near the center, this is the bus you would take. The x96 Athens Airport to Piraeus Port bus is the next most popular if you are heading straight to the port to catch a ferry to one of the islands. The other 2 buses are the X93 Athens Airport to Kifisou Avenue bus, and the X97 Athens Airport to Elliniko bus. When I travel to and from Athens airport I choose to use the bus as it is most convenient for me. (It literally drops me off outside my front door!). When leaving Athens Airport Arrivals from the middle doors, turn right. Start walking along the pavement, and you will see a little blue ticket office. You can buy your tickets here. Once you have them, continue walking along in the same direction looking for the X95 sign. When the bus pulls up, don't expect an orderly queue Northern European style! Be as quick as you can, and grab a seat! Once you have your seat, THEN you can validate your ticket in the ticket stamp machine at the center of the bus. If you don't, you may be standing for the entire journey. Pros: Cheap. Runs every 10-60 minutes depending on which route, 24/7. Convenient if staying at a hotel on Syntagma Square. Cons: You might not always get a seat. Somewhat confusing if you need to get off a few stops before the final destination. Feels crowded. On some days the bus can make the journey in 45 minutes, on others, it might take 90 depending on traffic. Dave's Opinion – If you know Athens or where you are going, using the airport bus is probably the best option. I would say it isn't the easiest way for people new to Athens or Greece, or for people with lots of bags. So, now you know how to get from Athens airport to city center, it's time to start planning your time in the city. Luckily, I've got some great blog posts to help you out! This guide on what to see and do with 2 days in Athens ensures you see all the main highlights. If you are looking to go a bit deeper though, my ultimate guide to Athens is the perfect resource. Of course, if you have any questions or comments about visiting Athens I would love to hear from you. Please leave a comment below! At that time you only have two options – the bus (if you happen to be staying close to centre/Syntagma Square, and a taxi. I’ve never heard of gettransfer. If you do need to get a taxi, I highly recommend pre-booking using the service described in the article as you’ll know the price upfront. his summer and staying at Best Western Candia Hotel. Which transport sytem is the best from: Venizelos Airport, please? It depends on the time of day and your energy levels! The absolute easiest way is definitely taxi. Details in the article to pre-book if you prefer. The second best way is by metro. You would need to change lines at Syntagma to the red line for the station nearest your hotel (ΣΤ.ΜΕΤΑΞΟΥΡΓΕΙΟΥ), and then walk the distance to your hotel. Hi Dave! My partner & I will be arriving at ATH on April 29 and staying until May 04…at which time we will be heading off to Rhodes for four more days and then on to Kos for 3 days after that. 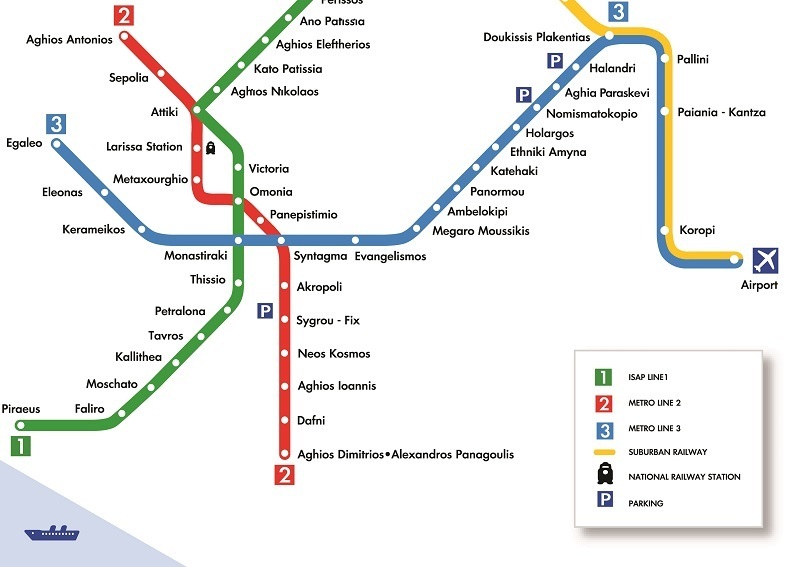 While in Athens, we will be staying at The House…is it easy to get to by using the Metro? Do you suggest renting a car while we are in Athens or on any of the islands? I hope you are easing into the weekend! I can’t say as I know where The House is in Athens. If it is by the metro though, it is very easy to get around. I would suggest against hiring a car to get around Athens itself – the historic centre is for the most part walkable with the odd metro journey. Also, parking is a real pain in Athens, and the driving is not for the faint of heart! On the islands though, I’d suggest hiring a car to get around to different areas of the islands. It will give you a lot more flexibility than public transport, and is way more cost efficient than taxis! Thanks a lot for nice info here. My wife and I will have 8,5h between flights and we wantto go for a round to see the Acropolis. Is metro the fastest way to get there? Otherwise what would you reccomed? Close call between the taxi and metro – you’d need to change lines on the metro at Syntagma to get to Acropolis. Probably within 10 minutes of each other though. Hi Dave. Great blog! We are four guys who will be doing a bicycle tour through Europe during the next three months. We will be following the Eurovelo 8, 9 and 6 routes. We are flying from JHB to Athens this coming Monday and will be staying at the Nubian Hostel for a couple of nights. What would you say is the best way for us to get our bicycles from the airport to the hostel? I hope you have a great tour through Europe! From the airport to the hostel, I’d say the best way is on the metro – you should use the last carriage. Technically, only two bikes are allowed at any one time, but … well, this is Greece! I’ve not checked where your hostel is, but you may need to change line. You could even cycle between the last stations. A bit of a pain, but the metro could be the way to go again. If not, look for a company online called baggagement (I think that’s their name) – they might be able to offer something. BTW – I cycled from Athens through Europe a couple of years ago. If you’re after a little last minute inspiration, take a look here – Cycling from Greece to England. Happy tailwinds for your trip! Hi Dave, great blog thanks! I’m arriving at Athens airport tomorrow at 18:10, only with one bag hand luggage and I need to get to Novotel – 4 Mitchail Voda Str 104 39. Am happy to take the airport bus but wondering which stop to get off at and then how do I get to the Novotel? Thanks in advance! Not sure you’ll read this in time, but whatever option you choose (metro or bus), you’re going to end up with a 20 minute walk most likely. Otherwise, get the bus to Syntagma Square and then a taxi from there. Thanks so much, does Uber work in Athens still? No Uber does not work in Athens at the moment. Look on your app store for something called Taxibeat. It’s a Greek run company that does the same thing. Hi, Dave, nice blog. what time do the buses start to run in the morning? Hello Dave, your site is very informative. We are flying into Athens on June 13th at 12:30 p.m. and want to make our way into the City. We are staying at Ersia Boutique Apartments, Megaloud Alexandrou Street can we get the Airport bus to this location. We are on a budget just two of us. if you are landing at 12.30 (not 00.30), your best bet would be to take the metro. You’d then need to swap lines from the Blue line (airport metro), to the red line. If I have your hotel right, your nearest station is Metaxourghio Station. The bus doesn’t quite get you far enough to your hotel for it to be of much use I think. Hello, thank you for the excellent advice and blogs. My wife and I are visiting Athens next week (Sun-Tues) and then leave for Santorini early Wednesday morning. Our flight is at 06:55. We are staying near the Athens Central Market area. At that time of day, best to do taxi or bus? How early should we leave (we will just have carry-ons, no checked bags). Also, coming back from Santorini, we land at 09:05 and our flight back to the US leaves at 17:25. What is the best thing to do during that layover that would be nearby the Airport? Thank you for the help! Apologies for the late reply – you may even be on a plane now! At that time of day, a taxi is your easiest option – you can pre-book using the link almost at the top of the page in the article. Bus is by far the cheapest option, but you’ll have to walk over to Syntagma Square first (about a 10 minute walk). Athens isn’t a great layover city, although you have a great bonus with only hand luggage! There isn’t much of interest near the airport, so you might decide to go back into central Athens. You’ve really only got 5-6 usable hours though (allowing for check in time), 2 of which are likely to be used getting into and back out of Athens. Another idea, would be to visit the Temple of Poseidon at Cape Sounion. You’d probably need a private car for this though to make it worthwhile. Although I have never used their services myself, if you Google “George the famous taxi driver”, many people have said they enjoyed their services. Have a fantastic time in Greece! Has the various means of transport from the airport to the city centre been affected by the bushfires? We arrive in two weeks. The bushfires had no effect on transport as they happened many miles away from Athens. 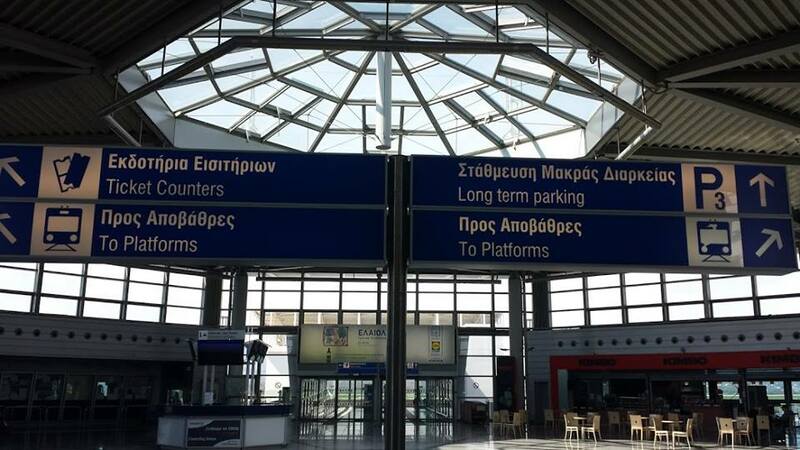 All transport to and from the airport and Athens is running as normal! we are thinking of renting a car for a few days trips outside of Athens any suggestions for car rentals and where to go? we were thinking of Delphi one day. should we book our tickets for popular sites in advance? Those times can be based on both the walk to the metro and if you have to wait 10 minutes for the next one. With jetlag and all, maybe a taxi would be better or the metro. Personally, I take the bus but you are never guaranteed a seat. For day trips with a car – You definitely have to see Delphi – I’m writing this from my tent there actually, as I’m just doing a cycle tour of central Greece! My suggestion is to allow 4 hours for the site to explore at a leisurely pace. If you are feeling adventurous, you could then after lunch drive on to Meteora (Kalambaka). You should get there in time for the sunset on the rocks. Stay overnight. The next day, you could then visit some of the monasteries. After that, drive back to Athens and aim for the Temple of Poseidon for an evening sunset. For car rental I know no companies personally – Perhaps Hertz are a good starting place as they have depots in town. For more info on planning your trip to Greece with things to see, sign up for the newsletter through the box. Each day, I’ll send you some more info about different things to see and do in Greece. Thankful I found your website; as an ex-Athinian I never imagined I would ever be confused about the public transport in Athens! As far as I can tell there is some sort of tourist-pass for 3 days (which would cater our needs) but the Airport-City trip is not included. We arrive July 6 around 8 pm and depart Piraeus at July 9 around 7am and we’ll be using public transport on all of our days in Athens. Trying to keep it low-cost, would it be cheaper to buy a one-way ticket into Athens on the 6th and a separate 3-day pass for public transport then taking a taxi on the 6th and then a 3-day pass for public transport? Hope your travel planning for Greece is going well – I wonder how much Athens will have changed since you last visited? For transport – I wouldn’t plan it right now, because quite likely prices and policies will change for all services between now and July 2019. If you’re staying in the centre, I wonder if you even need the day pass for transport at all (depending on how much you want to walk). You can always buy individual 24 hour tickets for the days you want to use the metro. For the taxi cost – it depends how many people you are travelling. Depending on when you arrive, it might be better to get the bus/metro on the 6th, and instead put you budget into the taxi to Piraeus early in the morning. Hi Dave, thank you so much for your reply. Reading back I notice I left some details out but doesn’t matter, we’ll figure it out somewhere in 2019 before our trip starts. I used to always take the metro to Piraeus but “conveniently” forgot the chaos and sometimes long distance walking. Does the taxi still drop you off right at the dock? Left 11 years ago and haven’t been back, I’m sure it will be an emotional rollercoaster! Yes the taxi can take you straight to your dock, potentially saving you a very long walk! Hi Dave,. Are tourist allowed to Bring in canned food, instant noodle etc to Athens? Hi – As far as I am aware, tinned and packaged food should be ok to bring in. I bring in stuff from the UK from time to time, and I have never had a problem! Hi Dave, is there ferry service from Athens to Myknos on early Nov 2018? Do we need to buy the ferry tickets in advance or buy on the day itself when reach jetty? Thanks, Dave, for your informative insight! I have a reverse question to which I couldn’t find the answer and I hope you could assist. We are departing Athens at 03:15, so we have to get to the airport at 01:00. We live near the Ambelokopi station. According to another website, the last metro to the airport departs at 23;11, arriving at the airport 32 minutes later. Should we take the Metro and arrive a the airport an hour early, or should we take a taxi? Is there a flat rate taking a taxi from the town to the airport? I understand it’s more after midnight; does the cost increase at the start of the trip or at the airport? Thank you for your assistance and we look forward to hearing from you! Hi Nancy – If I was you, I’d take the metro in a little earlier and save yourselves the extra cash – even though you may spend it in the restaurants at the airport anyway! Taxi price will be over 50 euro if you arrive at the airport after midnight. Generally speaking, Athens is a safe city. Petty crime (pickpocket) is your only real concern on the metro, with one station in particular – Akropoli. Keep your eyes on your bags if using the metro from the airport and going through this station. The area to avoid staying in, in my opinion, is Omonia. I’d also maybe include Exarchia in the avoid to stay in area depending on how world-wise you are. You should definitely visit Exarchia during your stay though if you have time, as there is some great street art there. Have a great time in Athens! We arrive in Athens at 4am! Is there any public transportation at that hour? Yes there is. Either use the taxi (best to use the pre-booked option mentioned in the article), or the bus which is 24/7. The metro service from Athens airport doesn’t start until later. We will be a group of 4 ending our trip to Greece with 2 nights in Athens in mid October. Our flight leaves on a Friday morning at 8 am (so probably leave the hotel at 5am) We have a hotel booked for those 2 nights in the city. My question is – do you think we should change and stay the last night in a hotel at the airport? I’m wondering what traffic is like early in the morning and if the typical 40 min commute is longer at that time? We would prefer not to change hotels, but if it would make the morning easier getting to the airport it may be worth it? I think you would be better in your central Athens hotel. There’s really nothing to do out by the airport if staying at the Sofitel. At least in the centre you can get one last good meal in and a stroll around the Acropolis at night! Maybe choose to pre-book your taxi as decribed above – keep in mind you will be paying a higher rate because of the time of day. The traffic isn’t a major issue – leaving at 5 am would be fine. Have a lovely time in Athens/Greece! I’ll be visiting Athens in October with my mom, and I feel like I can’t do enough research. This was so helpful, thank you! Do you have any suggestions on what to see and do that doesn’t involve too much walking/stairs? I’d love to see all the must sees in Athens, but my mom’s knees are bad, and I’ll be very pregnant. Thinking about it, a lot is going to revolve around walking! 1. Pick and choose at a gentle pace from my Things to do in Athens guide No rush. And there’s plenty of places to grab a coffee and sit down to admire the historic centre particularly around Plaka. 2. Take the ‘toy train’. This runs through the centre, starting from Syntagma Square. You’ll get to see the main highlights without going in. 3. The hop on hop off bus. This could be a good way to get to see most of the highlights of Athens. You could get off where and when you like. On a good day, sitting at the top might give you some nice angles as well. I have researched a fair bit about getting my way from Athens airport to the city. I am fairly confident about getting the bus X95 or the Metro however I arrive at 6.35am on a Tuesday morning next week. I’m guessing i will be hitting peak hour traffic by the time i get through and onto a bus? Traveling solo the usual suitcase on wheels and carry bag! Metro or bus? In terms of the rush hour, I don’t think it would make much difference, so maybe the bus from the airport into Athens would be fine. The only thing is, seats are not guaranteed, and if you’ve had a long flight, maybe you don’t want to stand for an hour getting into Athens center! I’d suggest at that time to take the metro in, and enjoy your seat! I’m hoping to travel to Athens in August this year staying one night before catching the ferry to poros. Returning a week later and staying another night before flying back to London. My eldest daughter has aspergers . I will be travelling with two younger children. Could you recommend a budget hotel we could stay at please. I think this is too much of an open ended question to answer as one person’s idea of budget is different that others! Still, try this as a starting point – Budget hotels in Athens . Keep in mind these are budget for a reason though, and some areas are not the best! All the best with your trip to Greece – I’m sure you’ll love the island! As a solo female arriving late (my flight lands at 9:30pm) would you say its safe to take the metro X95? It appears to be less than a 10 min straight shot walk to my hotel. In my opinion, Athens is one of the safest European cities. Assuming your hotel is near Syntagma Square, the bus X95 is totally safe. You’ll see plenty of people out at 10.30-11 when you get to Syntagma Square walking around, taking photos etc. Great information, Dave. Thank you for doing this. We are a family of 4 adults arriving in July. I have 4 specific questions, but I thought I would post our entire itinerary in case you had some comments or suggestions for us. Tuesday July 19 12:15 afternoon – Arrive Athens, staying at the Amalia Hotel for 3 nights. Friday July 13 07:50 morning – Olympic Air flight to Chania, one night at Pandora Suites, no car. Saturday July 14 morning, hiring a car for 2 days, going to Herkalion, 2 nights at GDM Megalon Hotel. Monday July 16 09:00 Morning Hellenic Seaways ferry to Santorini. 2 nights at Aressana Hotel, no car. Wednesday July 18 08:40 Olympic Air flight to Athens. Car booked at airport, driving to Nafpilo, staying 2 nights at Amalia Hotel Nafplio. Driving around the Peloponnese. Friday July 20 11:40 (Morning) flight from Athens. Will drive from Nafplio that morning. We are going to buy Turbo pass for Athens, which includes all public transportation for 3 days. 1. On the Turbopass website you are offered to have the passes post directly to your home in advance for a fee, or to have theem sent directly to your Athens hotel free. Since we intend to use the Turbopasses for public transportation from the airport, it occurs to me that we must pay to have the passes sent directly to our home so that we will have them to use before we get to the hotel. Am I missing anything here? 2. With a flight out of Athens at 07:50 what time should I leave the Amalia Hotel to be there in time? Public Transportation starts at 05:30 but that does not mean that is when I will be picked up on the Metro. Will this be in time or do we need a taxi? 3. With an 08:40 flight from Santorini to Athens, when should I get to that airport? I have heard bad thing about the lines there. 4. When we leave Nafplio to drive to Athens for an 11:40 (Morning) flight, when should we leave Nafplio? Thank you for looking at these questions. If you have any other comments or suggestions about the rest of the travel plan, we would appreciate that as well. 1. You are quite right – looks like a bit of an error on the part of Turbo Pass, and I’m also surprised they haven’t got an app or electronic version. If you are a family of four adults, the taxi from Athens airport may be a better option in any case, and if you contact Welcome through the links at the top of the article, maybe they could somehow arrange the passes for you? No promises on that one – just thinking outside the box! Worst case scenario – you lose out 10 euros each by having to pay for the metro, or 9 euros each by taking the taxi. 2. I would always say to be at Athens airport 2 hours before your flight leaves. Your two choices are taxi (not sure, but I think you pay the higher price), or taking the X95 bus from Syntagma Square (24 hour service). Bus journey from the centre at that time will not experience delays. For a 7.50 flight, I’d be looking to wait for the bus around 5.30. 3. Santorini airport is a bit of a joke! You neither want to get there too early (it’s small), nor too late (the queues). Double check with your hotel, but I’d say being there 1.5 hours before the flight is more than enough! 4. Not sure if you are driving direct to the airport? Again, based on getting to the airport for 9.40, and allowing time to drop the car off (half hour? ), I’d say leaving at 6 or 6.30 is advisable. You’ll more likely than not hit Athens traffic as well. By this time though, you’ll be used to Greece, driving and all the rest of the things involved in travel – do a double check on Google maps for driving time , and it will also show if there are delays or roadworks. Your itinerary looks excellent – have a great trip to Greece! Hey, we are arriving in Athens at 9 am 24th of May and leaving 29th of May 9:25 am. We need to get to Agios Ioannis station. What would be the best route? How far is it from the city centre? On the same note, the ticket system is confusing. I suppose it is best to buy 5 days ticket and separate tickets to the airport, right? The ticket system can be flexible – which is what makes it confusing! Two options – on arrival at the airport, go to the tourist information desk where you can ask their opinion about what ticket will suit you best. Other than that, just spend some time in fornt of the ticket machine going through the options to choose what’s best for you, and then buy tickets/day tickets as you need them. Thankfully, in comparison to other European countries, single fares and day passes are affordable, so it’s very hard to make a massive financial mistake! You’d need to change at Syntagma station (the main central station), and then head in the direction of Elliniko. You’ll need to use the metro to get back into the center of Athens to do your sightseeing later. Happy to hear it’s been of some help, and I hope you enjoy your time in Athens/Greece. Yes, 70 Euro is crazy money! This would be for a ‘luxury’ private vehicle – in my opinion no need unless you really want to. Your two cheaper options are the X95 bus, which drops you off less than a minute walk away from your hotel on Syntagma Square (final stop – really easy!). The second cheapest is the metro – again, it’s going to stop at Syntagma Square so get off there. If you prefer the taxi option, I’d suggest you pre-book using the link towards the beginning of the article (Welcome Pickups). You could also take one from the taxi queue – but there might be a wait. Note – If by some chance you arrive AFTER 12PM at your hotel your taxi would charge the higher evening rate. By using Welcome, you could confirm if that would still be the case or not. Personally – If there’s two of you with a couple of bags each I’d get either the bus or the metro. I have a few questions! I arrive in Athens at 9:40am on a Delta flight from NYC on August 11th (Saturday) and then plan to take a quick flight to Mykonos – there is one at 10:45am and another at 11:20am (or something like this). Do you know if we will need to go through customs before boarding our second flight? If so, I assume you’d recommend the later flight, right? On the way back to Athens, we will fly from Milos and land at around 8pm on Tuesday, August 21st, and stay in Athens for the night as our return flight to NYC is at 2:15pm the next day. I have not been to Athens but I usually take public transportation when I visit other cities. We have limited time in Athens so we also want to maximize our time and plan to have dinner and walking around at night, and then see the Acropolis etc. in the morning before we leave for the airport. With this in mind, woukld you suggest taking the metro both ways (you mentioned 18 Euro for 48 hours per ticket, I believe?) or would you suggest paying for taxis in both or one direction? We are okay spending more money if it’s worth it. Any general suggestions would be appreciated! Based on what I’ve read, I think we are planning to stay at Hotel Amalia Athens, Electra Palace Hotel or the NEW Hotel in Syntagma Square. If you suggest avoiding the metro given our timing, we would likely stay at Hera Hotel or Herodion Hotel (which I read require a metro transfer) in the Plaka. I also looked at some hotels in Monistiraki but these stood out a bit more location wise. I’ll bullet point brief answers to your questions! * Assuming there are two of you, I’d choose the metro. 3 or 4 people, and I’d go for the taxi. Stay at one of the hotels near the Acropolis or Syntagma Square so you don’t have far to go to the historic parts you want to see the next day as you mentioned. Actually – you seem to have everything pretty much organised and researched!! You’ll have enough time to see the Acropolis in the morning before you go back to the airport. Not sure about the Acropolis museum as well, so if you are debating between splitting the time, my opinion would be to concentrate on the Acropolis itself, and don’t worry about the museum too much. Thanks for your article! I will be in Athens as part of my 50 birthday trip and I have two pretty simple questions. As I will be taking the bus from and to the airport (I am staying near Syntagma Square) where do I pick up the return bus to the airport? Is it the same stop I get off the bus? Where do I purchase my return ticket? I am staying 4 days. If I could make one suggestion for an update to the article…stress the importance of validating tickets and the cost of the fine. I have seen others be given huge fines because they did not do this in other cities and it would be a horrible way to start your trip to Athens. Athens is a great place to celebrate your birthday – I hope you have fun! * The X95 bus drops you off at Syntagma Square. When you want to go back to the airport, take it from the same spot. You purchase your return ticket on the bus itself. Good point about validating tickets – Thankfully, you’ll find Greece is a lot more relaxed! The fine is big (60 times the ticket value!! ), however as long as you actually HAVE the ticket, you won’t have a problem. Most inspectors (the few there are) almost expect tourists not to have validated their tickets correctly, so help them to do so. When you board the bus, the process is easy as I described, but to repeat – grab your seat first, and then validate the ticket by holding the new electronic ticket next to the device. It will beep and flash green when validated. Have an awesome time in Athens! We are a family 5 person (4 adult and 1 child 6years old boy) can a taxi accommodate us ???? Difficult to say if the taxi would take you. Some might say its fine for the child to sit on the lap. The best is to just ask when you arrive at Athens airport and see what the taxi driver says. You could always take the bus or metro if you think that 2 taxis is not a good option for you. 4 of us with 4 medium size luggage + 2 cabin trolley bags arriving in Athens at 10 pm. Will the taxi be big enough to accommodate the numbers of luggage plus 4 passengers.? We are staying about 5 min walk from Acropoli Metro station. Thinking whether to take the metro or taxi. Please share your views. The best thing to do would be to just ask at the taxi queue. If they can get you all in the one vehicle, then that’s great. If they say it is two vehicles though, it is cheaper to get the metro. To get to Acropoli Metro Station, you would need to change at Syntagma station. My friend and I (2 females from Canada) will be travelling to Greece May 27-June 17 and landing in Athens the morning of May 28. We were planning to take the Metro to Syntagma station and then walk to our hotel “Athens La Strada” and possibly take the “hop on / Hop off” bus to see the sites in Athens for the first couple days before we join a tour group to 4 islands. We will be leaving the tour group before they head back for Athens and go visit Crete for a few days and possibly Corfu or back to one of the islands on our tour. then back to Athens for the final day/ night before we fly back. 1. you seem to feel we may have issues taking the Metro when we land, so do you recommend the Bus instead? I would have thought the Metro would have been easier based on my travels elsewhere in Europe. But you obviously know first hand. 2. How long would you recommend in Crete? we will have approx 7-8 days to see Crete and other islands such as Corfu or Naxos etc..
3. What is the best way to see Athens without in-depth historical information tours? We like a little history but not a history lesson. We coming mostly for the beaches and then for the History. 4. Hotel recommendation for our last night that has easy access to metro/ bus back to the airport but still in nice area and accesible to site seeing. 5. How hard will it be to get around on our own not knowing ANY greek? If you have time to answer any of my questions or provide any recommendations, I would really appreciate the help. I hope you have a great time in Greece – sounds like you have a lot ahead of you! I’ll answer your questions one by one..
1. Using the metro is not super-confusing – it’s just not entirely clearly signed. A little bit of patience, and it is fine. That said, the bus will take you right to Syntagma Square – That would be my preferred choice, there’s just no guarantee of a seat if it’s busy! 2. Crete is a massive island, almost a country in itself. If you just want to do ‘highlights’ such as Knossos and Chania, then give it a couple days. To really do it justice though, you need a week or even two weeks. Check out my guide on what to do in 2 weeks in Crete, and you could see what you might like to include from there. 3. The best way to see Athens is basically just to stroll around for a couple of days. The historic centre is reasonably compact, and you’ll get more of a vibe this way. I think I’ve previously linked to my 2 day guide in Athens in these comments and the article. 4. For really easy access to the metro back to the airport from the centre, one of the hotels on Syntagma Square would be best. It sounds like you could even return to your first hotel? If you want a splurge for the last night, check the King George hotel out! 5. It’s really easy to get around with no Greek. People are friendly and helpful! Have a really good time! We will be arriving around 9pm our accommodation is at the Akropoli stop on metro line 2 so we will have to transfer at the Syntagma stop, it all seems simple enough. My only worry is stories of crime (pickpockets) and people attempting to take your luggage while your holding it. Has it been exaggerated or is night time travel on the metro unwise. The metro is my preferred option, mainly because the Akropoli stop is directly across the street from our accommodation which means we don’t have to get other transport or walk far at night with our luggage. Yes your route and transfers are easy to follow, so you shouldn’t have any issues there. I have personally never had anything taken on the metro. My girlfriend who has used the metro every day for the last 10 years has only ever had someone try to take something once. My personal take on the metro is to be aware but not paranoid. It’s certainly not like Barcelona which is a nightmare! Common sense (no open bags, keep bags in sight, no wallets in backpockets) should see you ok. I would say any chance of pickpockets is not in the stations themselves, but rather on the platforms or in the trains. From your journey, I would show extra vigilance at the Akropoli platform and train, as this is normally very busy when compared to other platforms. In my experience night time travel on the metro is fine – There’s not a culture of men getting drunk after 8pm here really, so that air of possible aggression you find in places like the UK is not there. Wishing you all the best in Athens – have a great holiday! Hi Dave, We are a party of two college students and a parent. We arrive around midnight in Athens from London. I read the wonderful info you provided about the ways to get to the city centre. It sounded like the cab might be the easiest, but you also indicated it would be expensive. If we did take a cab how long does it take to get to Athens? Is there anything we could do to also be assured we don’t get ripped off? I considered staying at one of the hotels near the airport then taking a bus in the morning. The Sofitel was recommended, but it doesn’t seem to have rooms on our travel dates. Any other hotels to suggest? It’s one of those awkward times to land, but no worries! Personally, I wouldn’t stay near the airport – you might as well go into the centre. 1. 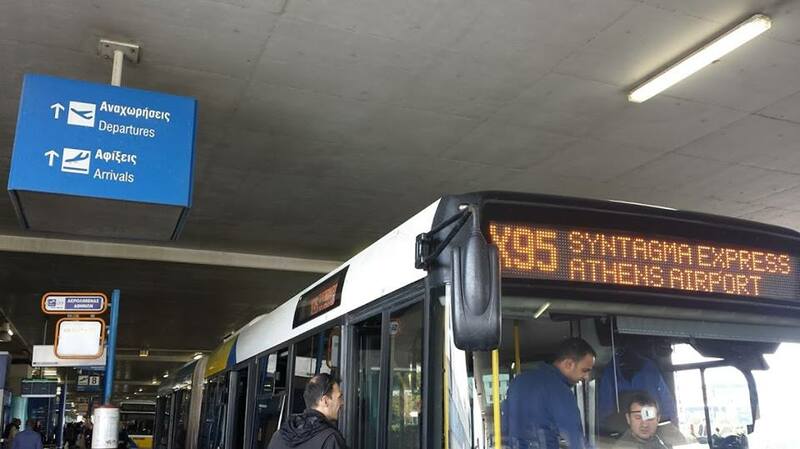 Take the X95 airport bus – It runs all through the night, and will take you to Syntagma Square. So, it makes sense (in my opinion) to stay somewhere within a nice walking distance of there. Athens is safe to walk at night in that area, and you will probably see plenty of people about to ask directions if you so needed, although I’m sure Google maps will help as well! 2. Take a taxi from the airport – The price is set, but you WILL be paying the higher rate. It would be like 17.50 each or something for 3 people (my maths is terrible sorry!). The bonus is that it will take you straight to the door of whatever hotel you choose. You could pre-book using the link provided. I would personally take option 1. Have a great time in Athens!!! Hi Dave… just a simple question are the Metro trains coloured co-ordinated with th the line eg Line 3 Blue line are the trains blue in colour?? From the airport, it’s actually pretty easy as the metro only goes in one direction. From syntagma square, each line has its own platform – you don’t need to worry about taking different trains from the same platform, as they are all the same. In the station, there is clear signs showing which direction the trains go in, and the stops along the way. It would not be possible to take 4 bikes on the bus unfortunately. Good news though – there is now a new Suburban train that leaves from the airport and goes directly through to Piraeus. I think it leaves every half an hour. You would follow the signs out of the airport to the train station (same as metro), and then ask for tickets for the suburban train – they will be able to help you out at the ticket office. The second choice would be to take the Metro to Syntagma station, and then cross to the green line for a second metro all the way to Piraeus. (this would not be my choice though). Note – Use the last / rear carriage as you have bicycles. Additional – I will also be cycling around the Peloponnese in April/May – maybe I will see you all on the road!! Amazing information. I thought Athens would be the only city I visited before hitting the different islands but now I’m thinking a day tour would be worth it. I’m going solo in June. Hoping to book my main flights from Canada today and continue my research.. I love history, but no necessarily museums. I was thinking of heading out for the day to an island, maybe even stay at one of them. Possibly Aegina. There are so many islands to choose from. I get overwhelmed the more I research. I’m a beach person. Love to walk along beaches and crystal clear water. Hard to decide which islands to visit and then where to stay on those islands. I’m reading great reviews on Milos and Naxos. So far I think I will skip Mykonos. Wondering if I should do Santorini. Some say it’s similar to Milos. I definitely want the see the white houses and the blue roofs. I have 3 weeks, that’s including travel time to Greece and back. Any tips or suggestions would be great. I want to maximize my time and the costs. Some say to go directly to an island but I was thinking of starting with Athens and can always finish with a night there to make sure I catch my flight. I don’t mind going by ferrys and some by flights. I saw one of your comments on ferry strikes. When and how often does that happen? Hi – I hope the trip planning is going well! From what you have mentioned, I think you would definitely prefer Milos over Mykonos. Milos still has a lovely authentic feel to it, and is much more ‘Greek’! As for Santorini – Well, in a way it would be a shame not to visit, but July and August are super busy – I hope you can visit outside then! As for Aegina – If you are already visiting at least one Greek island such as Milos, perhaps Aegina might not be worth it. A Delphi Day Trip might be a better one to take from Athens for example. I’m sure whatever you decide on you will have a lovely time here in Greece! Hi Dave, my husband and I plan to cycle from London to Athens this summer. Any tips for cycling in Athens itself? Also we hope to fly back but will need to buy suitable bike boxes from a bike shop. Can you recommend anyone we can contact about this? Any advice gratefully received! I hope you enjoy the cycle trip. You probably noticed that I cycled the route in reverse a year or so ago, and I hope you enjoy it as much as I do!. In terms of boxes for your bikes – There are a couple of bike shops in Greece you might get in touch with. One is a chain bike shop that is pretty good called cyclist.gr. They have a few different branches around the city, including this one – Mesogeion Av. 298, Cholargos 155 62. Phone: 21 0654 5022. You might get in contact with them around April and ask if they can put a couple of boxes to one side. Push comes to shove, you can always find enough cardboard to put together your own box with some good old gaffa tape! As for cycling in Athens – it’s not the most cycle friendly city in the world it has to be said. Cycling before 10.00 am at the weekends is the absolute best time! Actually, I just completed a mini 2-day bike tour last weekend, and I’ve got a video here you can check out. It should give you some indication for cycling in Athens! I was convinced on using the Metro this June until I read this. I’m going into the city by taxi. I will be spending 3 nights in Athens and I would like to join a small group for a guided tour of the Acropolis. Can you make a recommendation? I will be staying in the Plaka area. It’s lovely to hear from you, and I’m glad you found some of my articles useful so far! I’m sure you are going to enjoy your time here in Athens in February. I’m writing this at 09.30 and the sun is shining wonderfully outside though, so fingers crossed for February as well! In my opinion, a tour of the museum helps people get a lot more out of a visit than ‘going it alone’ so it’s a great idea. Please note – Some tours require that you purchase your own tickets for the acropolis and museum (you will have to check the details of this tour). If you intend to see 3 or more ancient sites in Athens (The Ancient Agora, and Kerameikos for example), it may be advisable to buy the ‘combined ticket’ which allows access to multiple sites. You can do some quick math on the spot when you buy the tickets, and see if this works out best for you. If you’re looking for things to do in Athens afterwards, my 2 day guide to Athens is all set at a nice gentle pace, and you can cherry pick activities and the things you want to see and do from there. Have a wonderful time in Athens! Great to hear you are visiting Greece soon! I’m sure you’ll love it at the end of March, and you should have some nice weather at that time of year. You for sure won’t need a car in Athens – Walking around the historic centre is easy, and the Metro system is fast and efficient. Mainland Greece – There’s two choice. Either stay in Athens and take day trips, or hire a car for just a couple of days. With a car you could drive to Delphi and see the site, and then on to Meteora to catch the sunset. In the morning, spend some more time in Meteora, and then drive back to Athens, where you could perhaps visit the Temple of Poseidon at Cape Sounion to see the sunset there. You might then (if you choose a good company), be able to drop the car off at the airport before catching a flight to Santorini. I would say flying to Santorini is the best option in terms of saving you time. Ryanair is probably an affordable option at that time of year, although Aegean is a great airline to use. Santorini – You could hire a car just for one day if you wanted to, although you might be able to see some of the highlights without one. I’ve just one question.. we have 7 ours between 2 flights. we only traveling with handlugage, is it worth it to go to Syntagma square for just a few ours? That’s a tough call! I think if you do decide to go into the centre, using the metro is your best option (about an hour each way). The only thing is, you would need to be back at the airport in time to get through security again, so allow like another hour for that. Let’s say it leaves you with a solid 3 hours in the centre. You could either walk around the historic centre (you will get some free views of the Acropolis and other historic sites), or use the time to only visit the Acropolis. If you are only likely to visit Athens once, sure it’s worth it and it could be kind of fun assuming you still have energy from the flight! Hi – You can buy a tourist card that covers from the airport into the city (return), and I think 3 days of metro usage. There is a new ticketing system currently in transition for the Athens metro – I’m hoping to make a video and updated blog post about it in a couple of weeks time! My pleasure – I hope you found the guide useful! 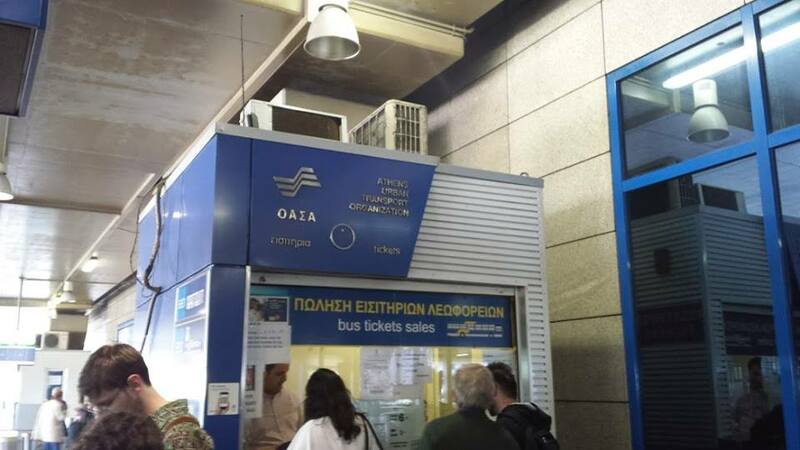 Note – They are changing over to a new ticketing system right now for the metro system in Athens. When it is fully functional I will update the guide accordingly. Dave, what about using UBER from the airport? Is this an option? We are a group of 5 (3 adults, two 6 year old boys). We will arrive at Athens Airport at 10am and our hotel is in town close to Syntagma Square. Are taxis able to accommodate 5 passengers? Luggage would not be too much of an issue, the trip will happen in mid June. Hi – Yes the flat rates are for up to 4 passengers. There is an organized queue outside the airport, so you can confirm everything before you even step foot into the car. Have a great time in Greece! I really needed this post a few years ago. We arrived in Athens without a clear idea of how to get to our hotel (stupid mistake I know). D thought we would get a taxi but I am very wary of airport taxis and really didn’t want to risk getting ripped off (yet again). We went to the airport information booth and they gave us complicated directions to a city bus. They didn’t even tell us the metro existed. We caught the right bus but got off at the wrong stop. It was a hot, stressful walk back to our hotel. For quite a while we weren’t confident that we were in the right area at all. Then we discovered the metro stopped almost outside where we were staying. Needless to say the return trip (on the train) to the airport was so much easier. I think you really have everything covered in the tour in terms of ‘must see places’. If you still have some energy left over, I would suggest visiting the Ancient Agora with it’s excellent temple. Hanging around until sunset to see the Acropolis is also an option, and there are a number of rooftop bars you might like to try such as 360 which have great views. You mentioned hotels – August is really peak month, so availability and bookings can play a part in ‘reasonably priced’. You could try the AthensWas hotel, which also has an excellent rooftop bar area where you could see the Acropolis at night. I’ve got a guide here to Hotels near the Acropolis which is a good starting point to begin making a choice, and I’ve included the AthensWas in there. I hope you have a great time in Greece!